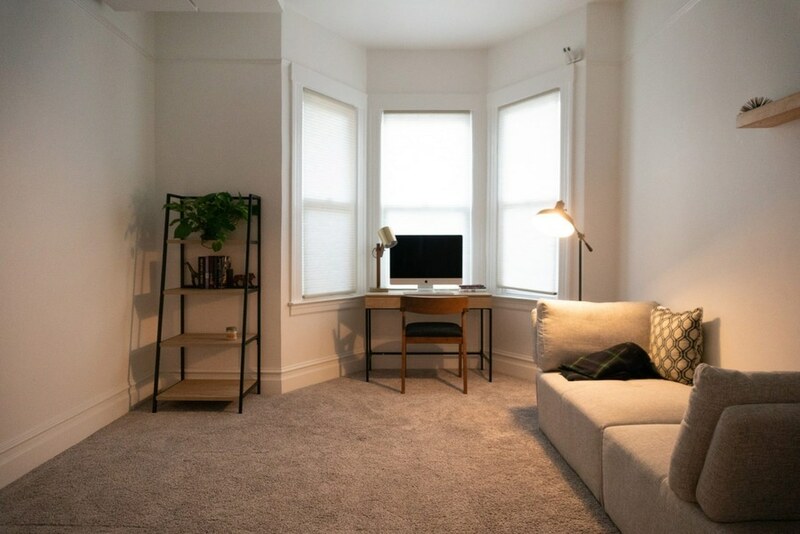 Tech startup Bumblebee Spaces is freeing up floorspace in small apartments with robotic furniture that drops from the ceiling and is controlled by an AI "butler". 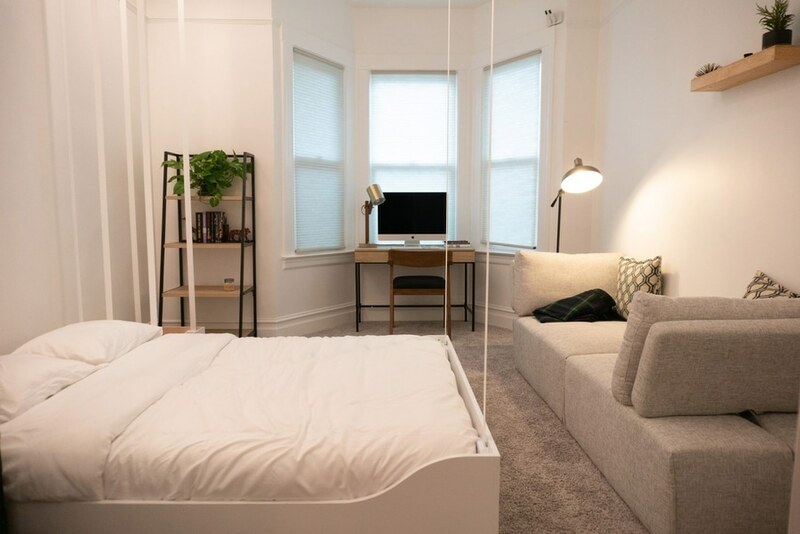 Bumblebee Spaces has designed a range of modular furniture and storage that can descend from and retract into the ceiling to change a room's function, or create more floorspace. An artificial intelligence system scans each possession as it is placed in a storage unit, tracking each item's location and anticipating the user's needs. "You can retrieve your things without searching for it. There's zero cognitive load, in fact it becomes an assistant, a butler for the resident," Bumblebee Spaces co-founder Sankarshan Murthy told Dezeen. "It knows where you've stored all your stuff and if you're on the way out your car keys, your shoes, whatever you need comes down. If it's going to be raining your umbrella comes down." 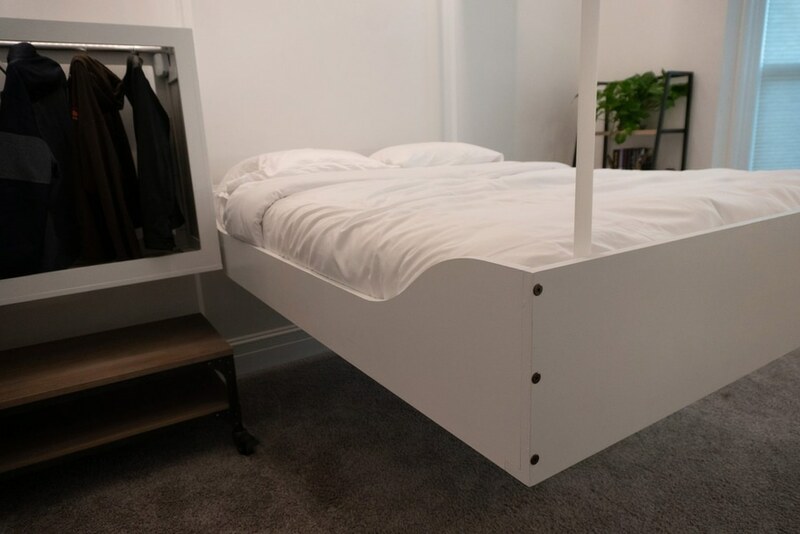 Murthy, an engineer who has worked at Apple and Tesla, developed the concept in response to the high rents on even the smallest apartments in San Francisco's Bay Area. "When I moved here I was overwhelmed by how much we were paying for so little space," said Murthy. "I come from a product background so I understood a lot about how we could densely pack objects really well. In the iPhone or Apple Watch we do such a good job of finding every micrometer of space to package all the features in so the user only sees the screen. "Murthy applied this logic to furniture with Bumblebee Spaces. 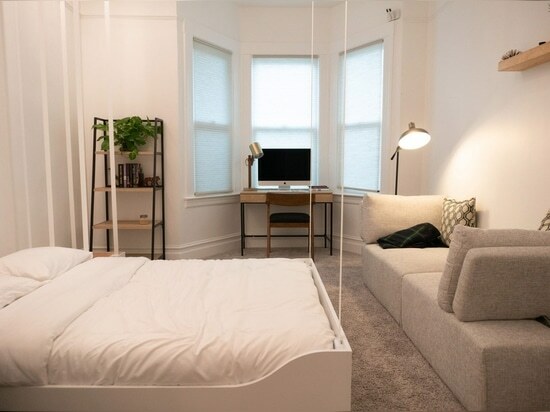 With modular furniture units installed in the ceiling a single room becomes a multifunctional area that can become a bedroom, living room, study or wardrobe. 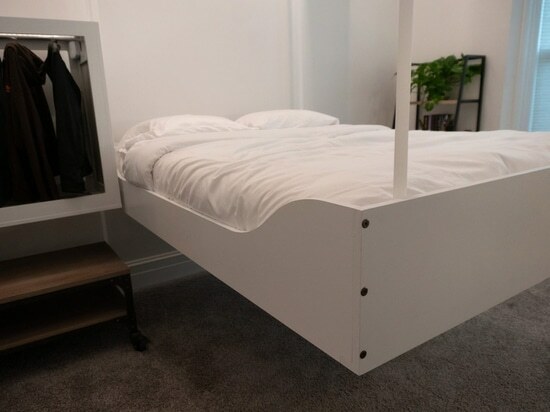 A double bed and a bedside table can descend at night and retract during the day, and clothes can be stored in the ceiling to provide the space and ease of a walk-in wardrobe without taking up any floorspace.Storage units are designed ergonomically, taking into account how far people can reach inside, and the height can be individually adjusted to suit different needs and abilities. In case of a power outage the electronics, which are run on a DC power supply, will have enough energy to run a couple of cycles. 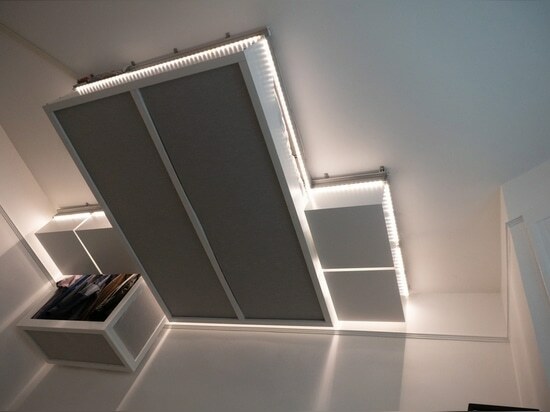 The modules can be retrofitted into most homes, and require between 30 and 35 centimetres of ceiling height. 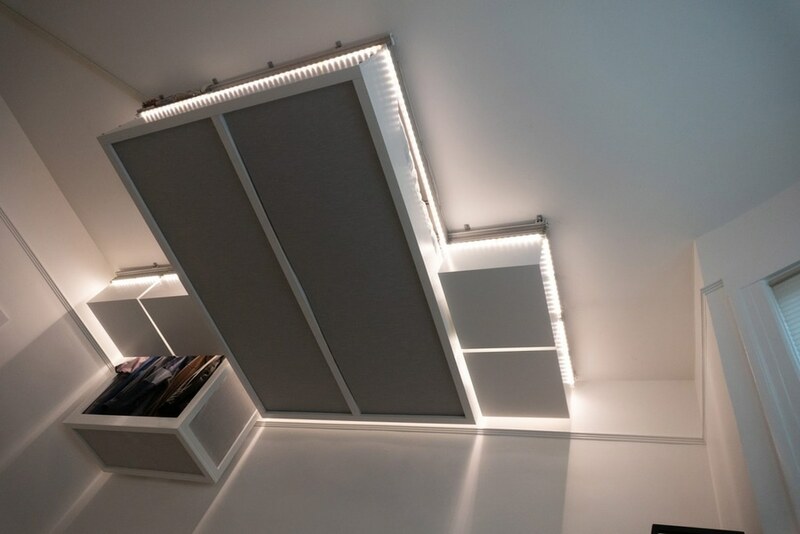 A full ceiling install with a bed, wardrobe and storage costs around £5,000, which Murthy claims is more cost effective than simply renting more square metres of space. "We are working with a lot of landlords who furnish their apartments and we then match or beat the cost of traditional furniture," he said. "It's significantly cheaper than the alternative of adding multiple rooms. "Bumblebee Spaces has created a software library of their modules for architects, so they can fit them into reflected ceiling plans for future buildings. The tech startup also has plans to bring out a range of specially designed accessories to compliment the existing units. For possessions that users find they use rarely, Murthy suggests, they will create a virtual marketplaces for users to borrow, lend or sell items. 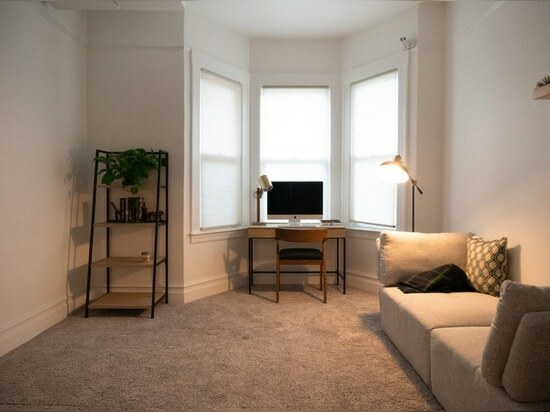 Using robots to find extra space in small apartments is something MIT Media Lab explored when they partnered with designer Yves Béhar to create a modular system that could fold out different pieces of furniture from a vertical unit.